Garlic and ginger root add a delightful touch to this quick, easy to fix, all-in-one dinner! 1. Heat a 12-inch wok or skillet over medium heat until hot; spray with cooking spray. Stir-fry the beef in 2 batches for 3 to 4 minutes. Remove to a medium bowl; cover to keep warm. 2. Add the garlic and ginger root to the skillet and stir-fry for 30 seconds. Stir in the water; bring to a boil. Break up the noodles; add to the boiling water. 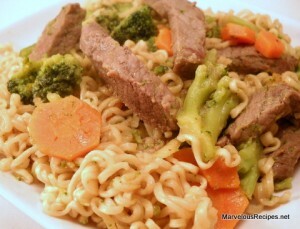 Stir in the contents of seasoning packets, broccoli and carrots. 3. Bring to a boil; reduce heat and simmer until the noodles are tender and most of the liquid has been absorbed, stirring occasionally; about 3 minutes. 4. Return the beef to the skillet and cook just until heated through, stirring frequently. Serve with a slotted spoon. Makes 6 servings.